The Annual Spring Tour of Homes and Gardens takes place March 21-24, 2013. This offers visitors the chance to tour private homes and gardens in a variety of historic neighborhoods in Savannah. Each day, a new neighborhood is featured and visitors are permitted to enjoy self-guided tours at their own pace, in any order they choose. Also featured during the four day event are several themed tours, seminars and dining opportunities. Guests are advised to wear comfortable and sensible shoes, not only for their own benefit ,but to protect the floors of the homes they visit. The homes do vary in size and style and many are elevated, with as many as 8-12 steps to enter. They are not handicapped accessible. It is also suggested to bring a water bottle along on the tour, as this is not offered in the homes, but there will be many chances to sample the fine foods of Savannah during your time here. Starting in March, you can come and enjoy First Saturday on the River, held the first Saturday of each month along historic River Street. You can see arts and crafts, entertainment and fun for all ages. Enjoy more fun on River Street on the first Friday of each month during First Friday Fireworks on the River. The Savannah Music Festival is one of the largest music festivals in the Southeast. This takes place March 20- April 6, 2013. “This Music Festival is dedicated to presenting a world-class celebration of the musical arts by creating timeless and adventurous productions that stimulate arts education, foster economic growth, and unite artists and audiences in Savannah. It is the largest musical arts event in Georgia and one of the most distinctive cross-genre music festivals in the world.” There is something for everyone at this music festival! 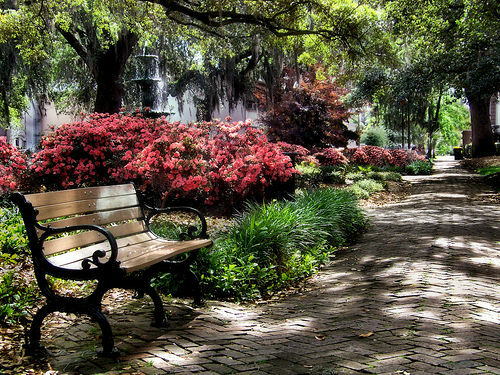 These are just a few of the fun things to enjoy in Savannah this Spring. As you plan your trip, you will want to check out the Bed and Breakfast that was voted best B & B of 2012 by Savannah Magazine: President’s Quarters Inn. This wonderful place to stay is located in the historic district and is convenient to all these fun events. The service and quality will spoil you and you will look forward to returning each day to your own little haven to rest, refresh, and be pampered. Click here to check now for availability!